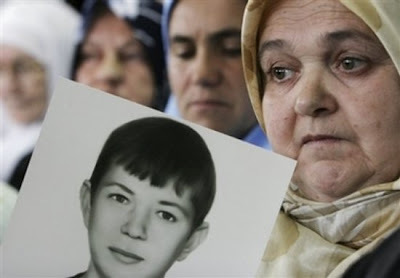 Photo Caption: Bosniak woman Nedziba Salihovic, right, holds a photograph of her late child, Kiram, during a meeting with a group of Dutch soldiers in a former United Nations base, in Potocari, near Srebrenica on Oct. 17, 2007. Twelve years after the Srebrenica massacre of over 8,000 men and boys, on October 17 2007, their widows and mothers met with ex-Dutch soldiers who served as peacekeepers in the Bosniak enclave during the Bosnian war. On October 16 2007, a group of Dutch soldiers revisited place of the worst massacre since the World War II. Kirk Mulder, the director of the Memorial Centre at Camp Westerbork, organised this trip between October 17-19, explained that a number of Dutch soldiers had wanted to go to the place where 8,000 Bosniak men and boys were killed by the Bosnian Serbs who had full logistical support of Serbia, as concluded by the International Court of Justice. "Why did you betray our children under the U.N. flag?" one woman shouted at the visitors. "Why did you come only now?" 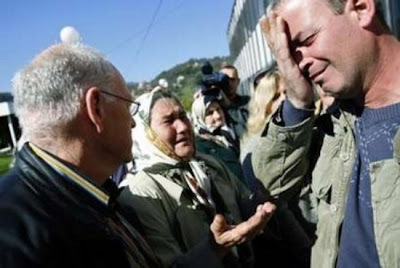 Photo Caption: Former Dutch peacekeeper Henry Van Der Belt (R) cries as he meets survivors and relatives of victims of the Srebrenica massacre in a former U.N base in Potocari October 17, 2007. "Today I feel the same helplessness I felt in those days," Monique Bergman told Reuters. Bergman was just 20 when she served as a peacekeeper at Srebrenica in the summer of 1995. "Not being able to do anything is a horrible feeling, which haunted me for years. For years I have been mentally ill because of what happened here," she said through tears. "I am trying to understand the pain and anger of the survivors and to show respect to the women and victims." Photo Caption: Former Dutch peacekeeper Boudewijn Kok visits his old army base near Srebrenica October 16, 2007. Dutch peacekeepers are looking at the graffiti. 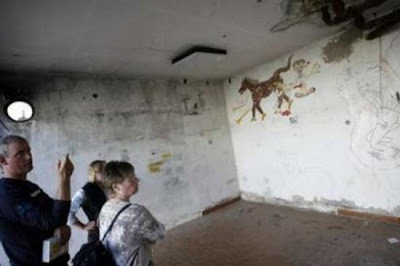 Some of these Dutch graffiti were especially offensive, as reported in this article. "I was here when all this happened, and now I am here again to pay respects to the victims and their families," said Boudewijn Kok, a 21-year-old at the time of the massacre. The twelve visiting soldiers had a stormy meeting with the families of Srebrenica victims on Wednesday, but the meeting was disrupted after they failed to give clear answers to the families’ questions on why they didn’t prevent the massacre. "They allowed them to slaughter us. I have nobody any more because of them," said Aisa Omerovic, 57, who lost her husband, two brothers and many other male relatives in the atrocity. There came a turning point in the tense encounter when a Dutch soldier recognised one of Suhra Malic's four sons in a picture as the child who used to sell souvenirs in the U.N. camp. "He recognised my son," she cried. One former sergeant named Rob said he managed to save a few men when the Serb troops began their separation process. "Even though 12 years have passed, we have not forgotten that genocide happened here. Our arrival is the proof that we have been thinking about it since," he told the waiting women. By blindly pursuing a policy of non-intervention despite repeated offensives by the heavily armed Serbs, the U.N. had given no order to UNPROFOR to fight off Serb forces, even if the 850-strong Dutch unit had possessed the military capability. Photo Description: Former Dutch peacekeeper Henry Van Der Belt (L) is comforted by a friend as he visits a memorial for Srebrenica victims in Potocari October 16, 2007. The association of Srebrenica mothers, has sued the Dutch government for a billion dollars in damages for failing to protect Srebrenica's Muslim population. It has asked the Dutch soldiers to testify against their government. The Dutch government resigned in April 2002 in a scandal over its role in Srebrenica, but refused to apologize for its actions. Instead, the Dutch government commissioned shameful NIOD Report ("Nederlands Instituut voor Oorlogsdocumentatie"). NIOD Report was the Netherlands's attempt to wash their hands of direct involvement in the Srebrenica massacre. For Bosnian Serbs, the Dutch visit to Srebrenica was an opportunity to continue with Srebrenica genocide denial by repeating discredited claims carefully prepared and delivered directly from Belgrade. A Bosnian Serb War Veterans’ organisation, comprised of Chetniks who participated in Srebrenica genocide, said this week it had a proof that at least one thousand victims listed as being killed in Srebrenica were alive or died before the July 1995 massacre. The so called "proof" came from (guess who?) radical Serbian nationalist and Belgrade researcher, shamed Srebrenica genocide denier, Milivoje Ivanisevic. His claims have been discredited on numerous occassions by both the International Criminal Tribunal and the Research and Documentation Center, for more you can read Questions and Answers about Srebrenica Genocide. Photo Caption: Former Dutch soldiers who served as peacekeepers with the UN peacekeeping force in Srebrenica during 1992-95 with family members and friends looking at the memorial wall with the names of 8,000 men, elderly and children who perished in the Srebrenica genocide. Editor's Note: Srebrenica Genocide Blog would like to thank 12 former Dutch peacekeepers for visiting Srebrenica and paying respect to the victims of Srebrenica massacre - the single worst act of massacre in Europe since the World War II. 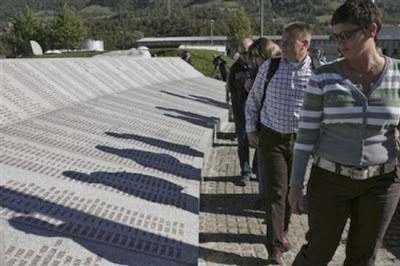 At least we have 12 people who had courage and will to visit Srebrenica Genocide Memorial and pay their respect to over 8,000 victims of Srebrenica Genocide - victims ranging from children to the elderly. Not surprisingly, the former Dutch commander, Colonel Tom Karremans was not among 12 courageous Dutch peacekeepers who came to pay their respect in Srebrenica. 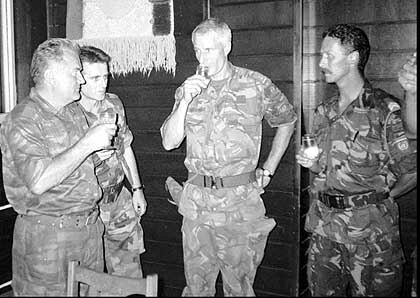 In fact, Colonel Thomas Karremans does not belong in this group, because he lost his manhood and humanity went he went on to drink a toast with Serb general Ratko Mladic (click here to see photo), while the Srebrenica massacre was taking place. Following negotiations between UN and Bosnian Serbs, on Friday, July 21st, 1995, Colonel Karremans and Dutch UN soldiers were allowed to leave Srebrenica. On the farewell, Colonel Karremans accepted gifts from General Mladic who committed genocide in Srebrenica, smiled, shook his hand and departed. As one of Srebrenica massacre survivors confided to us: "Thomas Karremans is an embarrasment of human existence." 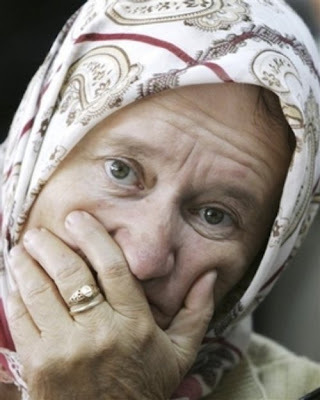 Photo Caption: A Bosnian Muslim woman looks on in disbelief during a meeting with a group of Dutch soldiers in a former United Nations base, in Potocari, near Srebrenica on Oct 17, 2007.